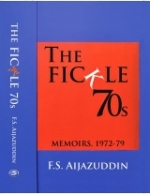 This volume of Mr Aijazuddin's memoirs covers the story of his personal and professional life after his marriage to Shahnaz in December 1971 until his departire for the Gulf in 1979. He narrates as an insider the nationalisation of industries, banks and insurance companies by Mr Zulfikar Ali Bhutto's PPP government in the 1970s, the reorganisation of the public sector with the creation of holding corporations, and the role of the Board of IndustrialManagement and later the Ministry of Production. His account recalls the abortive elections in 1977, the take-over by General Ziaul Haq, Mr Bhutto's trial for murder and his subsequent hanging in 1979. This volume is a sequel to the earlier volume of his memoirs - The Counterfoils of My Years, 1942-1971.